Housing Minister Uri Ariel: Israel must keep three ‘settlement blocs’ – Judea, Samaria and the Jordan Valley. Prime Minister Binyamin Netanyahu is reportedly planning to seek control over four “settlement blocs” that are home to a significant percent of the more than 360,000 Israelis living in the region. He expressed cynicism over the ongoing negotiations between Israel and the PA. “Nobody is amused by this absurdity, and nobody is buying it. They aren’t willing to recognize the state of Israel as a Jewish state, they wouldn’t recognize this studio as Jewish,” he told presenter Razi Barkai. 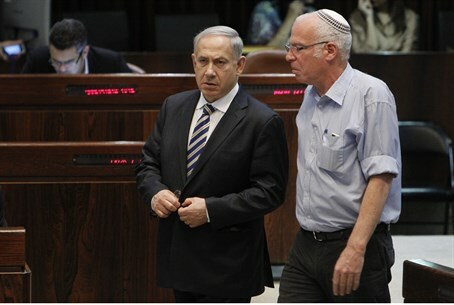 Ariel said he has seen no indication of progress in the talks, details of which have been kept secret from the public. “The Palestinians are acting evasive and using trickery and distraction,” he accused. He had harsh criticism for Israeli leaders who are willing to withdraw from Judea and Samaria. “What nation would give up those hundreds of years? The tombs of its forefathers?” he asked. “Can we surrender, can we tire out? 400,000 residents will prove… I think this is sinking in to the Israeli consciousness,” he said. “Even the Australian Foreign Minister has said she doesn’t understand why settlements are illegal,” he added.